Robert V. Di Meglio, M.D. Robert V. Di Meglio, MD completed his undergraduate degree at the University of Virginia. He graduated from Emory University School of Medicine and completed his urologic residency training at Washington University in St. Louis, Mo. 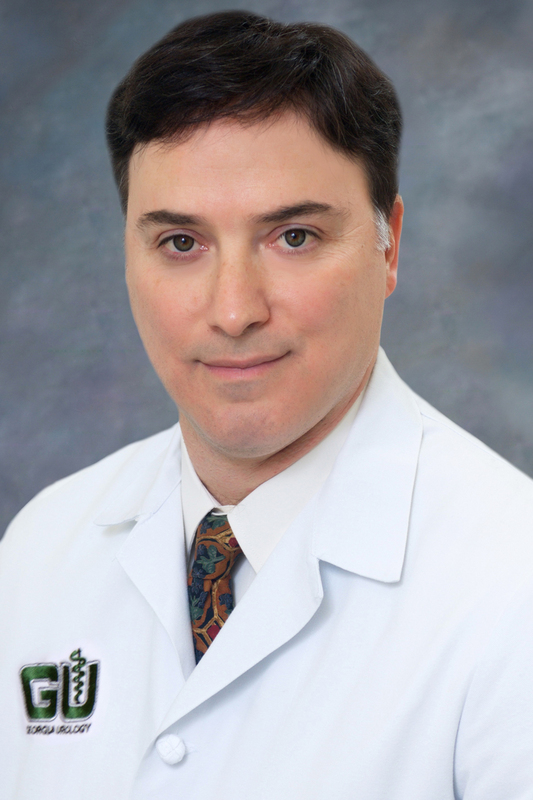 Dr. Di Meglio is board certified by the American Board of Urology and a member of the American Urology Association. In addition to general urology, his areas of special interest and expertise are kidney stone disease, prostate disease, voiding dysfunction, vasectomy and erectile dysfunction. Dr. Di Meglio lives in Buckhead with his wife and three children. He is fluent in Italian and enjoys music and golf in his spare time. GU Announces New Physician and Office Locations! Dr. DiMeglio is a superb physician with excellent patient care skills making one relaxed and confident you are in good hands. He shows care and concern and engages you on a level you can understand! The staff are all very welcoming and professional. You immediately have the feeling that they care about your concern, whatever it may be. Dr. Dimeglio makes an excellent effort to respond to any questions or problems. He seems to be truly interested in your condition and what will best accommodate one's needs. Customer service is always excellent. Tavia is always very friendly and pleasant. Dr Dimeglio is always prompt, courteous and makes his patients feel at ease. Great practice and people. Dr. Dimeglio is polite and knowledgeable. His staff is first class. I would recommend him to anyone in need of a great urologist. I’ve been a patient of Dr DiMeglio since 2011. I’m a chiropractor who has been practicing over 30 years. I know the difference between good and bad doctors. He’s great. Dr. DiMeglio is an outstanding doctor. He is kind, knowledgeable, efficient, professional and very caring. He always takes the time to explain in detail anything that I ask him. Dr. DiMeglio's staff is just as kind, efficient, professional and caring as he is... They pay close attention to my needs as well. My wife and I very pleased with my healthy outcome. :) Thank you Dr. DiMeglio for being there for us. Dr. Dimeglio's very professional as well as his staff -Did not hurry me--answered all my questions and took time with me to describe in detail the issues we discussed--this is the exception and not the rule--Dr. D is the 4th -5th Urologist I have used in the last 6-8-9 years--will continue to use him in the future!!! The receptionist is pleasant, the nurses (so far) do good sticks, and Dr. D. doesn't waste time. Neither does he behave like your presence is an imposition. He has a light but decisive touch, and a pleasant manner. Very caring and efficient staff. Dr. Dimeglio spends the appropriate amount of time explaining options regarding tests and treatment. Trust and open communication between a medical provider and patient is very important and I believe I have both of these with Dr. Dimeglio and his staff. Dr. Dimeglio is very professional and has an excellent bedside manner. He pays a great deal of attention to detail but takes the time to make sure that you thoroughly understand what he is explaining to you. His staff is courteous and always return calls in a timely manner. If you are looking for a good doctor that provides excellent medical care, Dr. Dimeglio and his staff should be your choice.